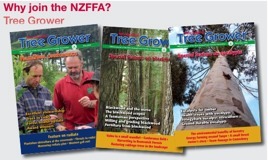 Author not published, New Zealand Tree Grower May 2013. 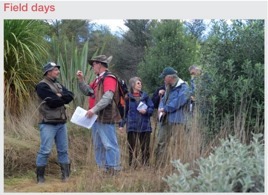 The Wiffen’s homestead is on the west side of State Highway 1 north of Parnassus, but the vast majority of their 1,400 hectare Inverness property lies on the east side of the road and railway. In fact it stretches more than ten kilometres in a narrow strip out to the coast, and to reach that rugged coastline you have to pass over a range of hills up to 600 metres high. From those hills on a clear day you can see from Kaikoura to Banks Peninsula and look down on the Waiau and Leader river valleys. Virtually all of their 40 hectares of exotic forest and 1.5 km of shelterbelts are on the accessible, more fertile land between the hills and SH1. They began by fencing off awkward corners and gullies. This has led to a network of forest blocks, shelterbelts and ornamental trees which have greatly enhanced the property and made the management of stock much easier. Although the average annual rainfall is 730 to 850 mm, the summers can be dry and hot so shade as well as shelter and water are essential elements for profitable stock management. All the plantings have been carefully planned to compliment the landscape, provide shelter from all directions and increase diversity. Widespread use of deciduous hardwoods adds colour and variety. Radiata pine is the prevalent timber species but cypress have also been widely planted along with smaller areas of Douglas fir and eucalypts. With the stress placed on plants by hot dry conditions it is not surprising to see that canker is leaving its mark on the macrocarpa. Charles has recognised this risk and recent plantings have made more use of hybrid cypress. A high pruned and very healthy stand of Leyland cypress seem to confirm that this is the best option as an alternative softwood to radiata. All stands of trees are well tended and stocked, with local contractors employed to do the work. Charles and Sandy have made good use of consultants and nursery owners for advice on siting and selection of species and on registering areas for the ETS. Farming steep broken coastal land in a sustainable manner requires a deft touch, an appreciation of natural balances and a vigilant approach to weed species. After 47 years of management the appearance of Inverness with healthy tussock on the hills and native bush still prevalent in the coastal gullies proves that Charles and Sandy have those skills. The land running down to the coast has many steep sided gullies and over the years the majority of these areas have been fenced off for ease of management and to protect the native trees and shrubs. A 27-hectare example of these gullies is in the process of being protected with a QE11 covenant. The local representative for QE11, Miles Giller, has catalogued an impressive range of plants and animals identified as living there. The more than 100 hectares of fenced off natives, augmented by scattered ngaio above the coastal cliffs, provides ample shade and shelter for stock in an otherwise exposed situation. Charles and Sandy employ a manager for day-to-day management of the 5,500 sheep and 550 cattle that they run on Inverness. The sheep breed has evolved from Corriedale via Romney to Perendale as wool has lost its importance in relation to meat. The vagaries of season and markets determine whether all stock is finished at Inverness, but the Charles and Sandy also have a small finishing farm a few kilometres to the south at Spotswood where irrigation provides certainty of grass supply. A wetland project on this farm is the next target. Charles and Sandy have both been heavily involved in their local community. Charles has been on the North Canterbury farm forestry branch committee for many years As well as operating a country store in Cheviot for 20 years, Sandy was prominent in theYoung Farmers movement and has served on local school, tourism and Plunket societies. Charles has chaired several school boards and has worked on many farming related committees and boards including those controlling rabbits and Chilean needle grass. He has also given much time to sporting groups both as a participant and administrator. Cricket has been a particular interest and Charles has been prominent at both local level as a player and regional level as a manager and administrator. The activity that takes up much of the Wiffens time is marketing their range of wines. These are produced on their 50 hectare vineyard in Marlborough under the watchful eye of their winemaker daughter. Charles Wiffen Wines have fared well at the awards and are another passion for a busy couple. Charels and Sandy Wiffen have used trees wisely on their farm. They win the Husqvarna award for the quality, variety and appropriate siting of their trees. The award also recognises their appreciation of the value of native forest and habitat and the contribution they have both made to their community.